Race past the competition with the supercharged performance of lead-generating website featuring an automated lead nurturing system. Our upfront Victory Lap package enables you to race past the competition, growing your business by capturing new leads and cornering the online market. It connects Web, customer relationship management, and automated marketing strategies to build an even stronger solution for your business. 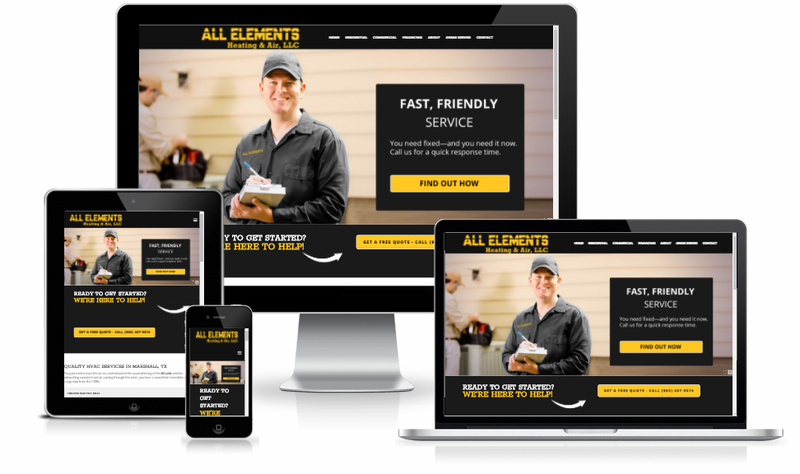 Check out our upfront custom website design packages! Gone are the days when we knew for certain that everyone was viewing the web on a desktop or laptop computer. Increasingly, people are viewing the web on a variety of devices - tablets, smartphones, and other mobile devices. If your website doesn't support those devices, this can negatively affect how users interact with your business. The site may load slowly, the layout might be fixed and awkward to navigate, and you may end up with a frustrated user. Statistics show that most users don't convert to a lead when using a site not optimized for small screen devices. This means you are losing out on valuable business opportunities. Our team can turn this problem around using responsive design. We'll redesign your website to adapt and scale to whatever kind of device the user is viewing from while maintaining your existing look and feel and improving overall performance. We'll test it on a variety of devices - mobile and non-mobile - to ensure the experience is consistent and easy to use. Tell the world about your successes through reviews and testimonials. Social proof is more important than ever to building brands, generating leads and closing sales. Whether we link to your Google, Yelp and Facebook reviews, or publish them via syndicated software, it's important to establish trust with your site visitors. Show off your products, promote a special offer or communicate your brand position. A slideshow gallery cycles through a series of images, one at a time. You can cycle the images automatically at a speed you choose, or you can turn off animation and let visitors use navigation controls to cycle through the images. The subscription includes a pop-up lead form and coupon plugins, ideal for informing visitors about seasonal specials or deals. Integrate a customer relationship management (CRM) database to help your sales team manage leads through the sales funnel. Give yourself a bird's-eye view of everything you know about the people, companies and other organizations that you do business with. Create tasks for appointments, meetings, phone calls, submission deadlines and more. See who's doing what and share tasks with co-workers. Most websites today have some sort of basic web traffic reporting in place. The leader in this field is Google with its free-to-use Google Analytics package. Out of the box, Google Analytics works great. However, most businesses do not take advantage of the powerful reporting capabilities that allow us to analyze conversion rates, campaign performance, traffic flow funnels and more. It takes a bit of know-how and sophistication to set up advanced tracking. Call tracking strategy allows us to measure the impact of marketing efforts on inbound calls. Each campaign receives its own set of phone numbers for your business. Every call is logged and tracked back to the source. We can even append this information into Google Analytics to gain further insights, such as web pages views, time spent on the site or goals completed. Note: We use an SEO-friendly approach to when implementing call tracking to ensure that we maintain the integrity of your company's information across the web. Tracking numbers are only used on your website through a dynamic process accepted by local SEO industry best practices. Marketing automation software and campaigns allow companies to nurture prospects with highly personalized, useful content that helps convert prospects to customers and turn customers into delighted customers. Unlike one-off campaigns, automation can be left running in the background, taking repetitive tasks off your plate. You can welcome your new subscribers, reach out to people who abandon their online shopping carts and win back lapsed customers. It's like having a second brain to help you run your business. Marketing automation software helps you stay connected to your customers every step of the way. Successful automated campaigns start by aligning messages to speak to your prospects at various stages of the sales process. Campaigns require careful thought and strategy throughout this funnel in order for automated marketing to be successful. Typically, automated marketing works best for companies who need to communicate with their leads and prospects through the entire sales funnel. Send a birthday or anniversary greeting, remind a client about a renewal date, or promote a product during a holiday. Fixed-date automated campaigns allow you to schedule a marketing campaign for a set date in the future. You may pick a fixed date from a calendar to send a mass email. Target your message based on a date in contact profiles that would run throughout the year. Who is your target audience? What is your tone? Playful? Professional? What do you want to say? The Find8 Campaign Brief documents everything we need to design and fulfill your campaign. The Find8 creative team will write and design your outbound automated campaign. Each email will be personalized where possible, such as a first name greeting. The design of your message will be tailored to match your visual brand identity. Managing reviews gains you credibility. See how Reputation Management can help. Keep customers aware of your online product offerings. Learn more about our E-Commerce website packages. You've got an awesome website! But is it getting seen in the search engines? Learn more about Search Engine Optimization (SEO). Coming up on your busy season or need leads now? Learn how our Lead Generation packages can benefit your business.